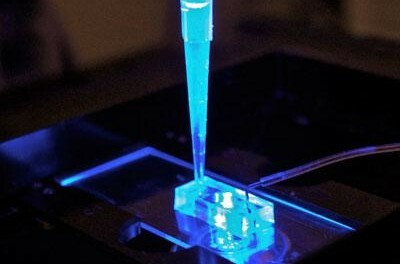 This organ-on-a-chip, reported in a study to be published Monday, March 9, in the journal Scientific Reports, represents a major step forward in the development of accurate, faster methods of testing for drug toxicity. The project isfunded through the Tissue Chip for Drug Screening Initiative, an interagency collaboration launched by the National Institutes of Health to develop 3-D human tissue chips that model the structure and function of human organs. The researchers designed their cardiac microphysiological system, or heart-on-a-chip, so that its 3D structure would be comparable to the geometry and spacing of connective tissue fiber in a human heart. They added the differentiated human heart cells into the loading area, a process that Healy likened to passengers boarding a subway train at rush hour. The system’s confined geometry helps align the cells in multiple layers and in a single direction.